Chocolate Peanut Butter Cheesecake. My husband Marcus is a sucker for anything with chocolate and peanut butter. So I created this chocolate peanut butter vegan cheesecake with him in mind. This healthy cheesecake is made with no refined sugar, gluten, grains or dairy! Unlike traditional cheesecake, this recipe is no bake and can be made very quickly! t starts with an almond date crust, then you have the creamy chocolate and peanut butter layer, and lastly, it’s topped with a decadent peanut butter frosting. Yum! I could seriously have eaten the frosting by itself! So good! I used a 6 inch spring form pan to make a high cheesecake. You can use a larger one if you like, just keep in mind it will not be as tall of a cake. Another great option is to make mini cheesecakes with a muffin pan. 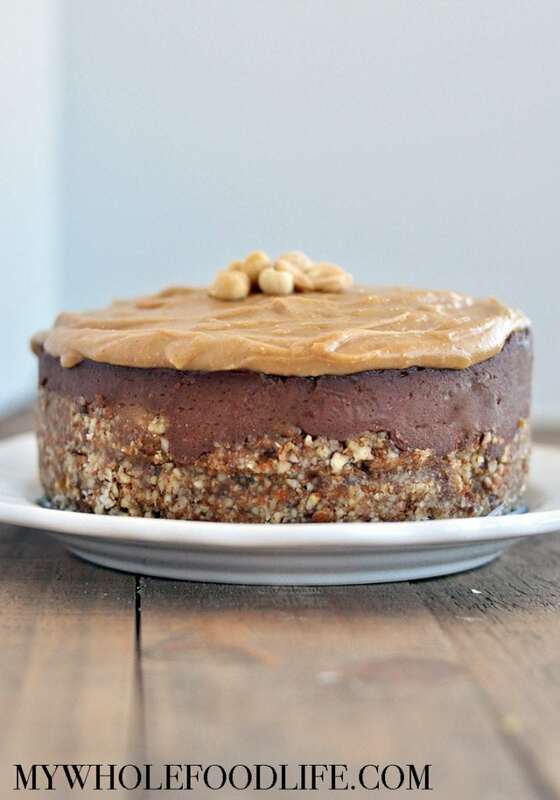 Chocolate and peanut butter lovers need to try this decadent Chocolate Peanut Butter Cheesecake! Vegan, gluten free, paleo and no baking required! In a food processor , add the almonds. Blend into a coarse consistency. Then add the dates and blend more. Lastly, add the water, one tablespoon at a time, until the dough forms. Press the dough into a greased 6 inch spring form pan . Place in the fridge while you make the cheesecake. Add all the cheesecake ingredients to a food processor and blend until smooth. Once smooth, pour into the spring form pan on top of the crust. Place in the fridge to firm. It needs about 4 hours to set. In a small sauce pan , on medium-low heat, add the frosting ingredients. Stir until everything is combined. Remove from heat. Remove the sides of the spring form pan. Transfer the cheesecake to a serving plate. Spread the frosting on top of the cheesecake. Serve immediately or refrigerate for later. Keep the cheesecake in the fridge. It should last at least a week. Enjoy! I love your book and your recipes; thank you. Just a question about this recipe, do the dates need to be soaked first? Hi Melissa; All your recipes you email are so ingenious and fabulous....i have loved making the irresistable ones. On this particular recipe, how can i substitute that processed oil? I do not allow myself to eat any processed oils because of their reputations and their dangers. Since any oil is not a whole food, what else could i substitute for this ingredient??? thanks for answering. You may be able to omit and add more cashews? I haven't tried for sure, though. Hi Melissa, J have a sensitivity to coconut, will using a different oil change the taste? What can I use instead of the coconut oil? You may be able to just omit and add more cashews? Just a guess. No other oils will solidify like coconut oil.